Also known as A Catechism of Christian Doctrine, THE PENNY CATECHISM gives 370 Questions and Answers on all aspects of the Catholic Faith. 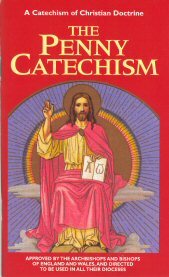 Having been approved by the Archbishops and Bishops of England and Wales for use in their dioceses, it is an official catechism of the Catholic Church. Topics covered include God, the Sacraments, the Ten Commandments, the Precepts of the Church, grace, virtue, sins and so forth. THE PENNY CATECHISM is excellent both as a basic class text and as a pocket-sized review of Catholic teaching for everyone. It contains concise, direct answers and provides a wonderful summary of the Catholic Faith.